In 2014, the project of Kenneth Shinozuka won $50,000 at the Google Science Fair competition. What inspired the 16-year-old boy to create this pressure-sensitive device is his will to protect his grandfather, who suffers from Alzheimer. The invention of Shinozuka makes caring for people with Alzheimer easier. Since his grandfather has this disease, Shinozuka was aware of the fact how frequent is among Alzheimer’s patients to wander off unattended in the middle of the night, and that this wandering could result in serious injuries. His device, called SafeWander, is a very simple, but effective solution to this problem. It is composed by three essential elements: a wearable sensor, a wearable circuit board and a smartphone application. The sensor part is made of a flexible, super-slim film that consists of pressure-sensitive ink-particles, which are electrically conductive. The second component is a coin-sized wireless circuit. This is a smartly designed, energy efficient circuit, because it operates with the Bluetooth low energy technology. This means that it consumes minimal power thus preventing the device from exhausting unexpectedly. These parts can be attached to foot, sock or shoe. Due to its thin and soft material it can be worn comfortably. Thirdly, the system requires a specific smartphone application to operate. 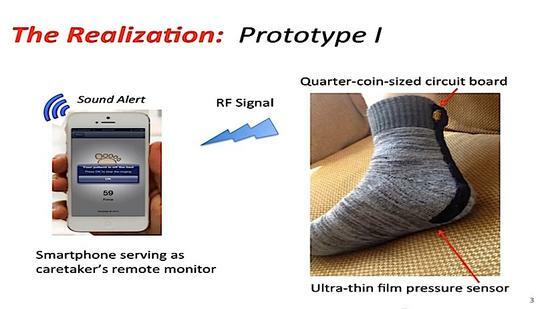 Once the patient wearing the sensor gets out of bed, the sensor sends a signal to the caregiver’s smartphone in a form of an alert. Unfortunately, the SafeWander system is compatible only with those Apple devices which operate with iOS 8.1 or with a newer version. Allegedly, by January 2016 the SafeWander will expand its compatibility list by adding Android mobile devices.